The White-winged guan (Penelope albipennis) was thought to be extinct for 100 years. The Guan had never been seen in the wild after Polish Naturalist Wladyslaw Taczanowski collected one individual in 1876. 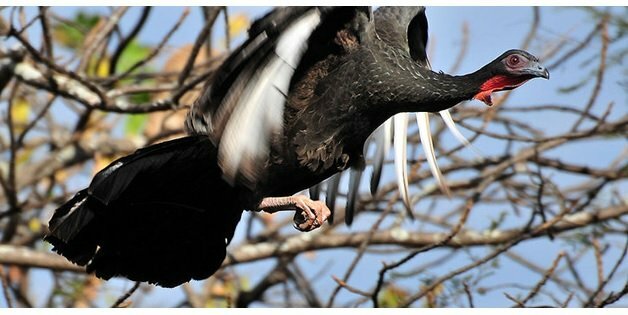 The story of the White-winged Guan, in some ways resembles the re-discovery of some species thought to be extinct. Nineteenth and early twentieth century naturalists collected birds on long and arduous exploratory expeditions in the New World. Some of these specimens had labels with basic information and were stored for further work at a later time. Some remained stored for decades before a researcher would pick them up and inquire about these poorly documented specimens. 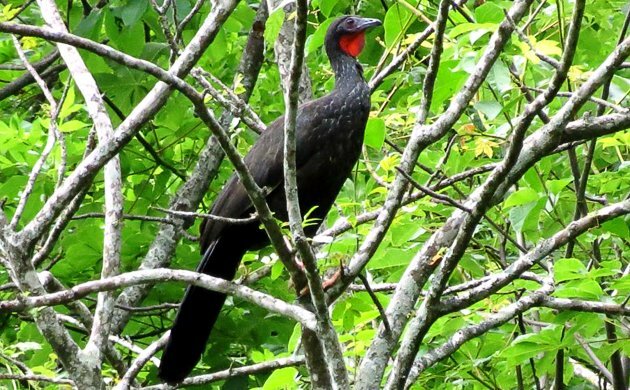 A White-winged Guan was collected in 1876 in a mangrove forest near the border between Peru and Ecuador. A large and striking bird like this would be hard to neglect in a museum collection. There were subsequent expeditions to the region in search of this Guan, but none yielded evidence of the bird. Perhaps the fact that the Guan was collected in a mangrove forest misled explorers to assume that mangrove forests were one of the Guan’s prime habitats. The Guan was declared extinct. The decades of storage in a museum came after it was regarded as an extinct species. There were reasons to think that the White-winged Guan had been extirpated by over-hunting. The forests at the collecting locality, including those that surround the mangrove forests, are largely flat and deciduous. These conditions offered easy access to hunters in a habitat where a bird as large as a Guan would have little chances to hide or scape. Hunting pressure in a heavily populated region (even for Nineteenth Century standards) and easy access were likely to result in the extirpation of the Guan in the regions surrounding the site of collection. The Guan remained under the radar for decades. After all, what was thought to one of its habitats had been heavily deteriorated and converted to agriculture as the human population grew. Nobody had seen a White-winged Guan, and they were not expected to persist in such disturbed area. It was decades later that Maria Keopcke, a German ornithologist with a long trajectory in Peru suggested to expand the search of the Guan to areas not surveyed before. This came as rumors of a turkey-like bird occurred in the steep canyons and foothill of the western Andes. Maria Keopcke convinced Peruvian conservationist Gustavo del Solar and American Ornithologist John P. O’Neill to mount and expedition deep into the canyons and valleys where the rumors came from. It is important to note that these locations were within 230 km south of where the Guan was first collected. It did not take long for the re-discovery of the Guan. The morning of September 13, 1977 Del Solar and O’Neill found a small flock of White-winged Guans. The amazing news went across the world. News anchor Walter Cronkite made an official announcement during prime time of national news in the U.S. Upon learning the news, the Peruvian Government declared the Guan as critically endangered and opened options to assess the population status and conservation measures. A captive breeding program was established with a facility at Gustavo del Solar’s property, not far from where the birds were re-discovered. Birds hatched in captivity have been re-introduced. A new flock was initiated in the private Conservation Area of Chaparri, within the local community of Santa Catalina. This flock is composed of about 54 birds including nine breeding pairs. Guans have also been introduced in the Laquipampa Wildlife Refuge. Here, eight captive bred birds were added to boost the numbers on an existing wild flock of 22 birds. Four of the introduced birds have bred in the wild. Recent surveys indicate that there are between 150 and 250 White-winged Guans in the wild, restricted to a band of 200 km. This is a very small number of birds in a small area. Conservation efforts continue and now include education and awareness campaigns among the local communities that own the land were the Guans still occur. Local people are becoming aware of the significance of having such an emblematic birds on their lands. Efforts to expand the existing population continue. The captive breeding program, now managed by Crax 2000 (a local conservation group) continues to hatch birds and make them available for further re-introductions. 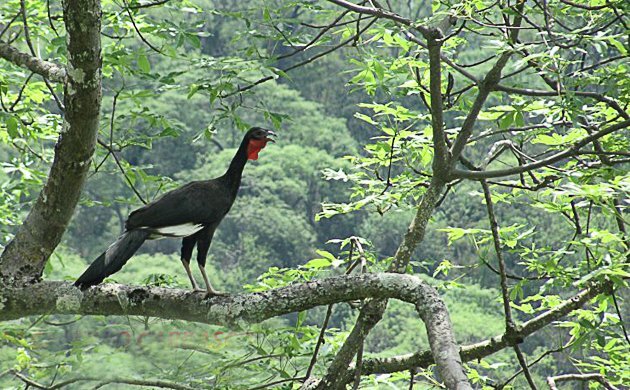 Biologist Fernando Angulo, who has been involved with the conservation of the Guan for over 15 years suggests that conservation efforts appear to be working as the Guan population has stopped declining and maintained itself stable in the last 15 years. New locations to start new flocks are being identified and it is expected that new introductions take place in the years to come. 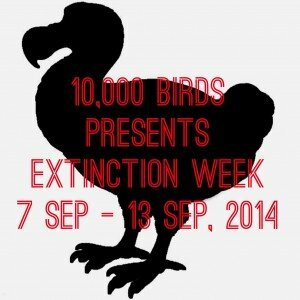 It seems that we have a second chance to keep this majestic bird among us. Featured photo by Rommel Gonzales. A fascinating tale, and one that has a good ending for once, let’s hope these enigmatic birds can make more of a come back (would love to see one, they look really smart). Thanks for the comments. There is a dedicated group of individuals behind the Gun’s recovery. More importantly, the locals are becoming more interested in having Guans in their land!!! Where Have You Gone, Rhodonessa caryophyllacea? Bird Number 300 in Queens and the Winner of The Warbler Guide Giveaway! Where Are You Birding This Fourth Weekend of November 2018?